Making the decision to reenlist with the Marine Corps for another tour isn't always as easy as signing on the dotted line. Even after a Marine decides to stay for four more, the Corps may have other plans due to some MOSs (jobs) being overfilled or undermanned. It may be possible, however, to turn the Marine Corps' "no" into a "yes." To do this requires you to change. The Marine Corps manages the population of military occupational specialties with a predetermined number of slots. Competing for these limited slots, known as "boat spaces," sometimes blocks a Marine from staying in the Corps for another term. This is where the lateral move program can provide a solution. "When Marines decide to reenlist, they can either stay in their MOS—if they get a boat space—or they have to make a lateral move if they want to stay in," says Gunnery Sgt. 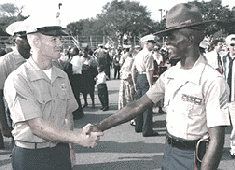 Stuart Morvant, the Corps' Manpower Management Enlisted Assignments lateral move chief. If a MOS has no more boat spaces, it is considered closed for re-enlistment. Most Marines are eligible to reenlist one year before their end-of-active-service (EAS) date, but first-term Marines cannot re-enlist until they are in the same fiscal year as their EAS. For example, a Marine whose EAS is May 2006 is not eligible to re-enlist until October 2005, the beginning of fiscal year 2006. First-term Marines have to be concerned by these "boat spaces." There are only a limited number of boat spaces open for first-term Marines in any MOS. When more Marines apply to re-enlist in a MOS than are boat spaces available, the surplus Marines must find a new job and make a lateral move into a new MOS. The first step in making a lateral move is to visit the career retention specialist. "Come with three lateral move choices in your head," said Gunnery Sgt. Charletta R. Anderson, Quantico's career retention specialist. "That way, if you don't qualify for a MOS or a MOS is closed, we can fall back on the next choice. When a Marine has only one MOS that (he or she) wants to lat move into, it makes it hard." First-term Marines re-enlisting from a closed MOS may apply to lateral move into any open MOS. They need a better chance of getting their choice if they apply for a MOS with a critical shortfall and a dire need of personnel to fill the ranks. In addition to the interviews and clearance level, these undermanned MOSs require high general technical scores from the Armed Services Vocation Aptitude Battery (ASVAB). But do not let low ASVAB scores stop you. "Lateral moving into any MOS depends on your qualifications and your ASVAB score," says Capt. Tricia Angelini, First Term Alignment Plan officer. "If you want to lateral move and you have a low GT score, retake the ASVAB." It is advised for lateral move Marines to take their time on the test and study in advance if they decide to retake the ASVAB. It is easy to not do well on the ASVAB if you do not prepare yourself properly. Once a Marine is deemed qualified for a particular MOS, a Reenlistment/Extension or Lateral Move (RELM) routing sheet is sent through the chain of command. "The RELM routing sheet is a discussion sheet to let the chain of command know what the Marine is planning to do," Anderson adds. "It states whether or not Marines are medically and dentally qualified, what their last physical fitness test score was, and if they have any pending legal issues. The sheet goes from their staff noncommissioned officer-in-charge to their officer-in-charge and all the way up to the battalion commander. The commander's recommendation is the only one that goes to Headquarters Marine Corps Manpower Enlisted Assignments to make the decision." Although lateral moves are intended to allow first-term Marines whose primary MOS is closed an opportunity to stay in the Corps, there are other situations where a lateral move can be an appropriate career decision. "Restructuring or downsizing of a MOS, the phase-out of legacy aircraft and military-to-civilian conversions are some indicators that a Marine would want to look at a lateral move and get a new MOS," says Maj. Mark Menotti, MMEA deputy head. "Sometimes Marines try to lateral move because they want a change of pace—something new," Angelini adds. If a Marine requests to lateral move from an open MOS, he or she must obtain a commanding general's endorsement. "It all depends on the needs of the Marine Corps," says Anderson. "Lateral moves are not a guarantee." For more information on making a lat move and Marine Corps MOS fields, visit the official MMEA website or talk with your career retention specialist.